located in the Tōhoku Region of northern Honshu, the main island of Japan. The capital is the city of Akita.
. Akita - Entries of this BLOG .
. Akita Kanto Matsuri (kantoo 竿燈 / 竿灯) .
. Bonden matsuri 梵天祭り Bonten Festival .
. Dainichi Mairi 大日詣 Visiting the Dainichi Hall .
. Daisen Town Festivals 秋田県大仙市 . 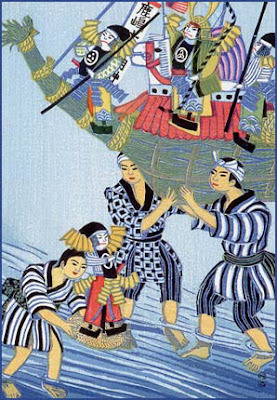 Small straw or paper dolls are floated on a larger reed boat to the shrine. They are dolls of samurai, called "Kashima". To pray for the good health of children.
. WKD : sanaburi 「早苗饗」(さなぶり) . 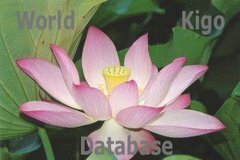 Related to the Tanabata celebrations. is a Tanabata related celebration in Akita City, held every year from August 3rd to 6th. 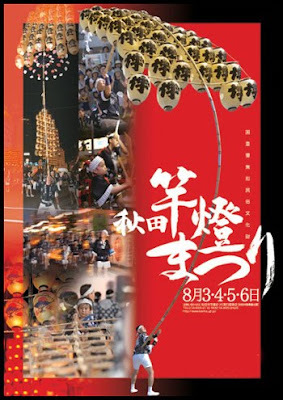 The highlight of the festival is an impressive display of skill in which performers balance kanto, or long bamboo poles with arrays of paper lanterns attached to the end. 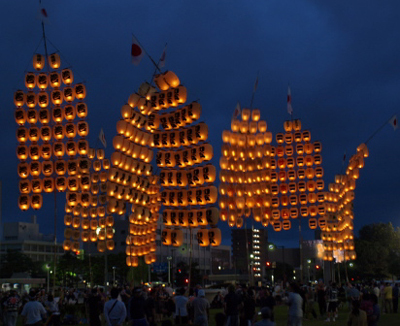 The kanto poles come in different sizes with the largest measuring 12 meters, weighting 50 kilograms and carrying as many as 46 paper lanterns, lit by real candles. To the sound of drums, flutes and onlookers chanting "dokkoisho, dokkoisho", each kanto is hoisted up by a single performer who balance them on end using various techniques. The performers change every few minutes and gradually add extensions to the pole until the kanto are at their maximum height. The main event of the festival, the Night Parades, are held nightly along Chuo Dori street in the center of the city. The various performing groups, carrying nearly 250 kanto poles, line up on the street, and when a signal is given, the poles are all raised up at once and the performers show off their skills. 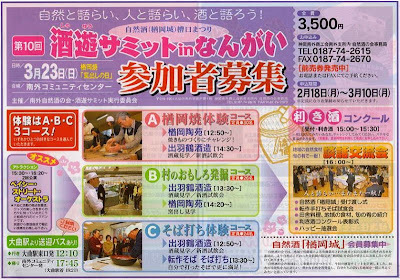 The event lasts about 90 minutes, and at the end of each night there is a 15 minute session during which the audience is invited to talk to the performers, take pictures and try their hand at hoisting up a kanto. The performing area of Chuo Dori is nearly one kilometer long and there is plenty of places to sit on the sidewalk along the route. The ends of the closed off road offer a particularly spectacular view, but can be more crowded. Reserved seats set up on the median of the road are also available for between 2000 and 2500 yen, and reservations can be made beginning a few months in advance up until the day of the event if not sold out. Naturally, it is more crowded on festival days that fall on a weekend. 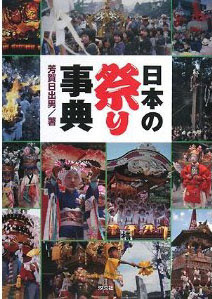 ist ein geistiges Nationalkulturgut der Präfektur Akita (important intangible folk culture property). Das Fest, bei dem die Gottheiten um eine reiche Ernte gebeten werden, findet kurz vor der Reisernte statt – dabei ist zu erwähnen, dass die Küstenebenen von Akita bekannte Reisanbaugebiete sind. Kantoo, ein Laternenpfahl, ist ein Bambusgestell mit zahlreichen Laternen in mehreren Reihen übereinander, die großen Gestelle haben bis zu 50 Laternen und können bis zu 50 kg wiegen. Sie stellen die vollen, reifen Reisähren stellen, die von den Göttern als Gegengabe nach dem Fest erwartet werden. Bei der großen Parade ziehen 200 Laternenpfähle durch die Stadt, abwechselnd getragen und balanciert von 3000 Männern. Allein das Balancieren dieser langen Stangen ist eine Kunst für sich, und Laternenträger ist der Wunschberuf jedes Buben in Akita. Kräftige Männer halten die Stangen auf den Handflächen, dann hieven sie sie auf die Stirn, runter auf die Schultern oder noch tiefer, auf die Hüften, immer schwankend und balancierend und umgeben von Gleichgesinnten, die bei Gefahr eingreifen und übernehmen können. Das alles geschieht zum Dröhnen der traditionellen Festmusik und unter anfeuernden Rufen der unzähligen Touristen (bis zu 1300300). Seit 1931 gibt es einen Wettbewerb für den besten Balanceakt, während man vorher mehr um die reine Manneskraft beim Tragen der Kilos wetteiferte.
. Folk Toys from Akita .